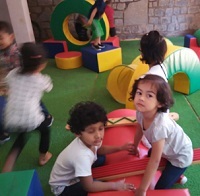 The school has the following facilities which make it a modern, learning environment for preschoolers. The play area has a fully equipped soft gym, and is on an area with soft, protective carpeting. This ensures that children do not get bruised if they fall, letting them jump and bounce to their heart's content. There is also a cycling area, sand pit and gardening area. 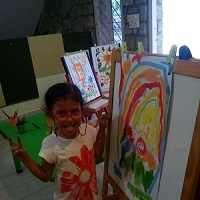 The design room is where little artists turn into masters of creativity. This is a fully equipped atelier with paints, colours, different types of paper and materials for various kinds of craft and clay work. The role play room is where children have the opportunity to give full vent to their vivid imagination! 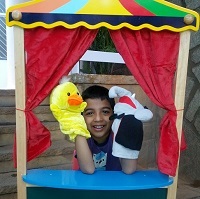 The room is equipped with plenty of equipment for pretend play - an integral and important aspect for developing spoken skills. 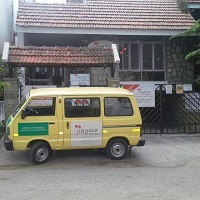 The school offers a van facility for those who require it. We have made it a point to follow all regulations applicable to school vehicles, and therefore it is as safe as can be for preschool children. At Jigyasa, we believe in using all the aids possible to bring the world alive for our children. 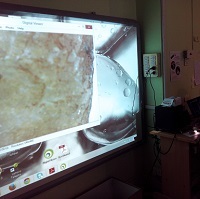 Therefore, the school is equipped with a smartboard, tablets, digital microscopes and other technlogy aids which children so naturally gravitate to these days.